All the belt buckles you see I make myself. 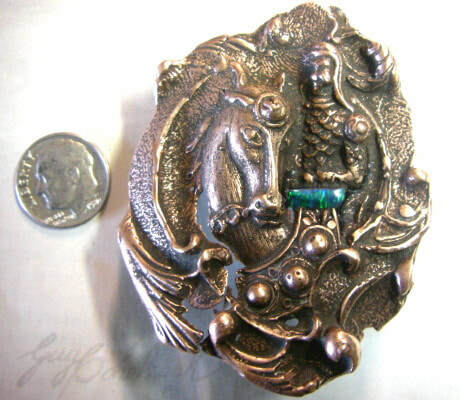 I do the original carving, make the wax, the mold, do the casting when metal is used. I find, slice, polish, the stones, usually Alaska rocks local to me. I sometimes use wood or fossils. I like to accent with opal sometimes. Left a copper cast buckle with opal accent. Copper is from old water pipes. This is an unusual mix of stone, jasper jade and quartz, rarely found together. Stone from the Yukon River. 3 x 2 x 1/4 inches thick. Fits most belts.